Apple's flagship 9.7-inch tablet form factor received a major upgrade on Monday, gaining the magnetic Smart Connector, A9X processor and four-speaker array found on its larger 12.9-inch version, as well as compatibility with the Apple Pencil and a new True Tone display, all for $599. 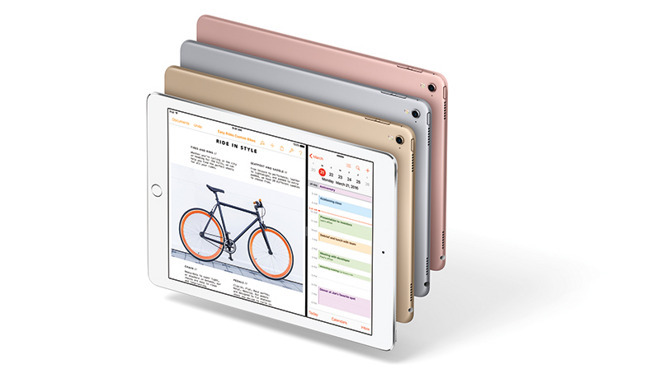 In a noteworthy upgrade over the larger iPad, the new 9.7-inch model features what Apple has dubbed a True Tone display. It features two new four-channel ambient light sensors that measure both brightness and color temperature to adjust the display accordingly, resulting in a "paper-white" viewing experience. Apple marketing chief Phil Schiller declared it's "quite a breakthrough." The display is also 40 percent less reflective and 25 percent brighter than the iPad Air 2. 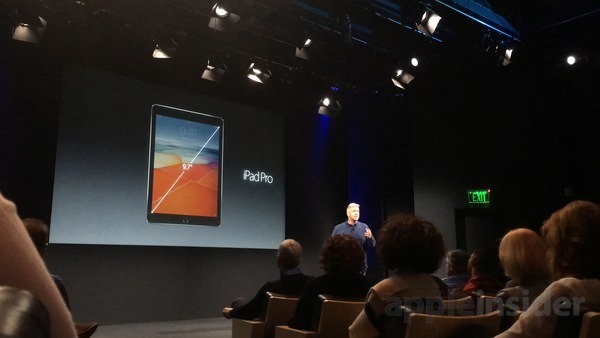 Apple says it's the lowest reflectivity of any tablet available. Color reproduction also hits new heights with the same color gamut offered on the iMac with Retina 5K display, as well as 25 percent greater color saturation than iPad Air 2. Stuffed inside its 6.1-millimeter case is Apple's powerful A9X chip, a 64-bit SoC design that rivals laptops in terms of raw performance. The silicon packs in the same GPU specs as the larger iPad Pro, offering console-class graphics with all-day battery life. It also includes the M9 motion coprocessor, which brings with it always-on Hey Siri capabilities. As expected, Apple built in support for Apple Pencil, meaning users can take advantage of the accessory's pressure- and tilt-sensing capabilities on a smaller canvas than the gargantuan 12.9-inch iPad Pro. 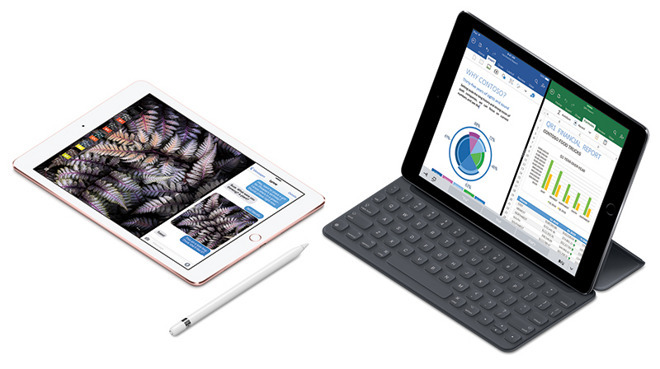 A new Smart Keyboard was also introduced on Monday, custom-designed for the 9.7-inch iPad Pro's form factor. volume is twice that of the iPad Air 2, and if onboard audio isn't providing enough oomph, iOS 9.3 adds support for outputting video encoded with Dolby Digital Plus audio streams via Apple's Lightning Digital AV Adapter. iPad Pro's communications suite includes 802.11ac Wi-Fi with MIMO technology, while cellular versions support LTE Advanced networks with up to 50 percent faster connectivity and what Apple is calling the most LTE bands supported by any tablet. Apple SIM comes embedded directly into the new iPad Pro, making it a simple process to get online when traveling abroad international. Around back, the new iPad sports a 12-megapixel camera capable of shooting 4K video. It also features a rear-facing True Tone flash and front-facing Retina Flash, another pair of upgrades over the 12.9-inch model. Apple also announced a new USB 3 speed SD card adapter, and USB-to-Lightning adapter. The 32-gigabyte model is available for $599, while a 128-gigabyte model will run $749. Apple is also offering a 256-gigabyte model for $899. A new rose gold option will be joining the usual space grey, gold and silver color options, while new cases and keyboard accessories are also available. Preorders will begin this Thursday, with shipments beginning March 31.